I love summer, and cooking local food, and putting together pretty dinner parties. So the Pacific Northwest simple summer dinner party I did with Sam Rosen, Mary Bodyen, Stemm Floral, and Kelsey Malie Calligraphy (see more photos here) was a great opportunity for me to try out some great summer recipes, with two types of salmon from Kenai Red Fish Company. I put together quite a menu, so I'll share these recipes with you one by one as I get them typed up! Let's start with the appetizer! 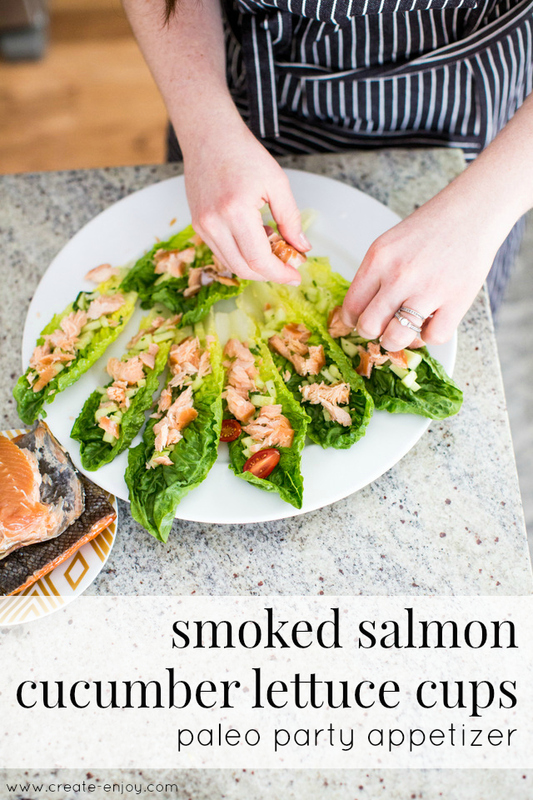 I know smoked salmon is delicious on its own or with simple flavors, so I wanted to use it in an appetizer. But I didn't know of many without dairy in them! 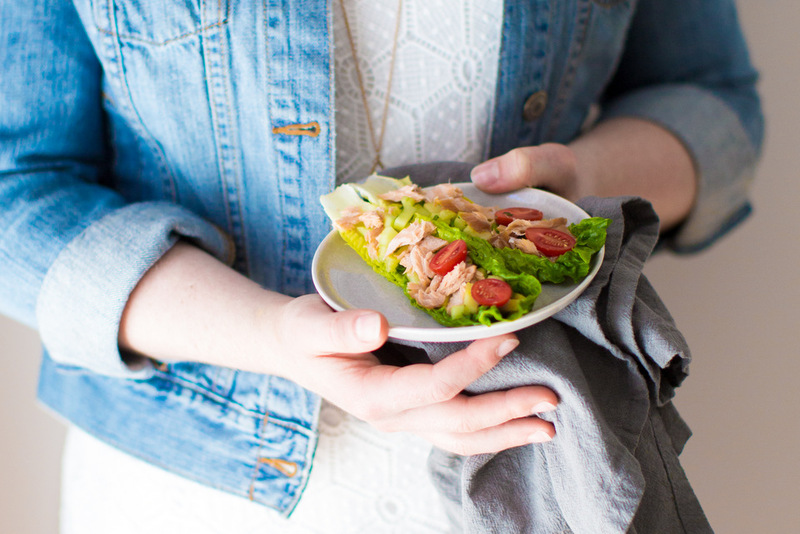 So I came up with these tasty cucumber-filled lettuce boats that are perfect with this flavorful smoked salmon. And dairy-free, Paleo-friendly. I used this delicious smoked salmon from Kenai Red Fish Company. This recipe is perfect for summer--you can get delicious fresh cucumbers and tomatoes at your farmers' market, and probably the cilantro, too! 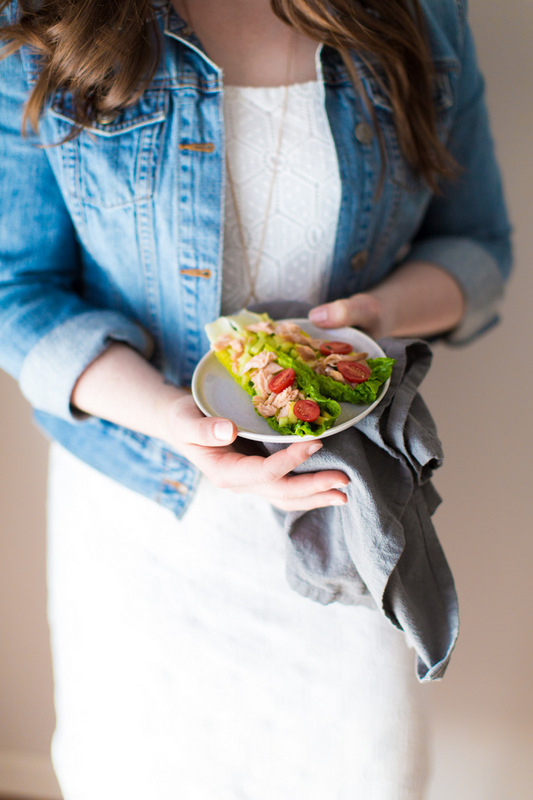 I got almost all the ingredients for this shoot from our CSA and the farmers' market! Marinate first 4 ingredients at least 4 hours, or overnight. Distribute cucumber mixture into lettuce leaves. 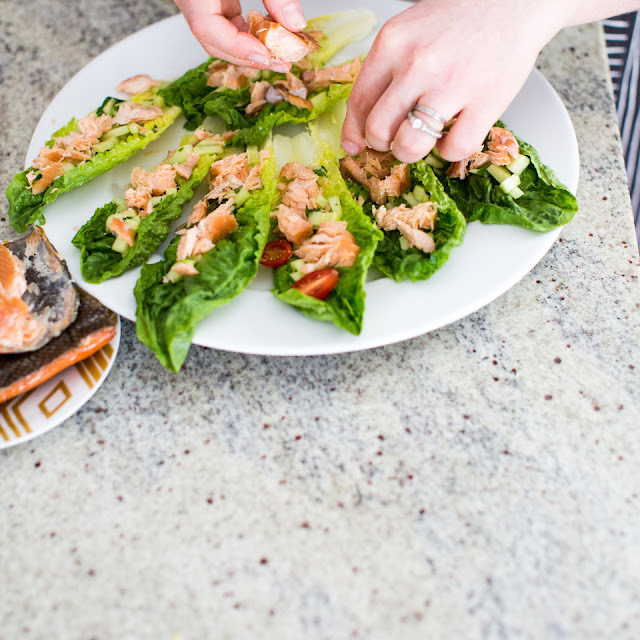 Break up salmon and distribute on top of cucumber mixture. Chop cherry tomatoes in half and put 2-3 halves on each lettuce cup. Eat with your fingers! The marinade drips onto your plate or napkin, so carry a cute cocktail napkin with you around the party as you eat these! The flavors are so simple and fresh. Perfect for showing off the high quality smoked salmon. And a great light appetizer, lots of veggies and tanginess before a big meal!